This is the sheet music to a selection on the CD "A Beautiful Classic Wedding" by Lace & Roses Music featuring harpist Stephanie Bennett. 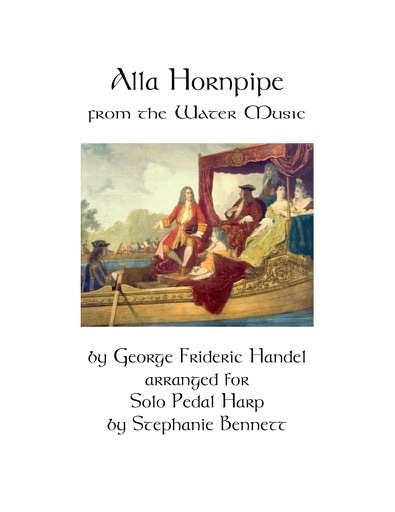 The Water Music was composed by George Frideric Handel in 1717 in response to a request from King George I of England for a concert on the River Thames. King George boarded the royal barge at Whitehall Palace, (accompanied by dukes and duchesses, earls and countesses) and floated leisurely up the river, followed by another barge carrying the orchestra of 50 musicians, who performed as they floated down the river. The king was so pleased by Handel’s music that he commanded it to be repeated at least 3 times, both on the way to Chelsea and on the return to Whitehall. The celebratory mood of the ALLA HORNPIPE movement makes it a wonderful wedding recessional! It is also appropriate for any other joyous occasion. This arrangement for pedal harp solo by Stephanie Bennett (“One of our country’s top harpists” - the Hollywood Reporter) is meticulously notated with fingerings, pedal changes and muffles where needed. All markings are explained in the Performance Notes. In its traditional AABA form, it is 4 minutes long. It is easy to make it shorter by playing fewer sections, or longer by repeating sections as needed.